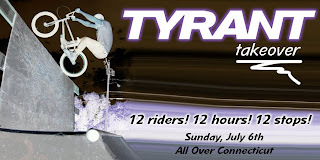 This coming Sunday, July 6th is what we are dubbing the "TYRANT TakeOver Tour". A bunch of guys (& T) are traveling to skateparks and street spots all over the state to ride, film, shoot photos, and have fun! Look for us in your town Sunday! Should be nuts!! K-Rob's got nothing on this!